The 1100 achieved its popularity despite being made during a time when more modern cellphones with more features (e.g. color screen, internal camera etc.) were available in the market. It was targeted towards developing countries and users who do not require advanced features beyond making calls and SMS text messages, alarm clock, reminders, etc. The 1100 is similar to the discontinued 5110/3210/3310 models that were among the most popular cell phones in the world during that time, before handsets developed several new features such as cameras, polyphonic ringtones and color screens. 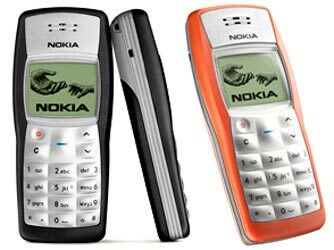 The Nokia 1100 was designed at Nokia Design Center in California, by the Bulgarian-American designer Miki Mehandjiysky. Nokia's one billionth phone sold was a Nokia 1100 purchased in Nigeria. In early 2009 it was in the news due to a firmware flaw in a batch of phones that were manufactured in a plant in Bochum, Germany. The phone could supposedly be programmed to receive messages directed to a different phone number, thus receiving sensitive bank or other data. This flaw was brought to authorities' attention after some phones were sold for over US$32,000 There is only one source, a non-existing bureau using the name Ultrascan, that all these articles fall back to. A proof of concept or any other evidence for its claims was, unsurprisingly, never published.